When we first got Tigger, we had a small pet bed for her that she just loved. 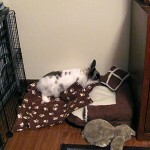 I wrote about how she would just put herself in to all kinds of bunny model poses on that bed. 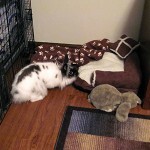 When Shadow joined our household a few months later and we started the bonding process, we found that the pet bed was something that was going to have to go because Shadow insisted on eating them. 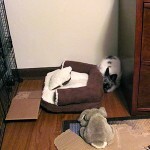 If we gave him opportunity, he would attempt to shred the beds and try to eat them. So we ended up with keeping the beds only for lining carriers on vet visits when it was really cold or they were really sick. Leo isn’t the chewer that Shadow was and he is a bit more like Tigger in some ways. So when we came across a really cute bed with a big mark down at the pet store, we thought it was worth a shot to see if Leo would like it. I just love the bed which looks like a mini sofa with a throw pillow. Leo has absolutely no idea what to do with it. 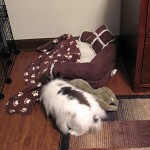 As you can see from the pictures, he will wander all around it, put front paws on it and that is the full extent of his interest in the pet bed. Leo has never once been on it to sit on it or lie down on it. We tried draping his blankie on it since he just loves his blankie and plays with that lying on it, burrowing under it and dragging it around to play with. The blankie draped on the bed was what finally got Leo to at least set his paws on the bed, but that is as far as he was willing to go. You will notice in the pictures that when he appears to put his paws on the bed, he has actually carefully positioned himself so that he is really standing on his blankie. 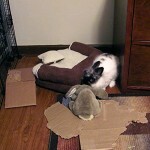 Unless we get another rabbit who likes the bed, this is likely to be one of the least used pet beds ever. We have had it more than a year now with him and it still looks brand new. Ah well, there is at least some hope today that Leo might adjust to his new Booda Dome litter box. He stayed in the room with it today for a bit. At some point he did hop in and check it out since I found he had used the facilities. 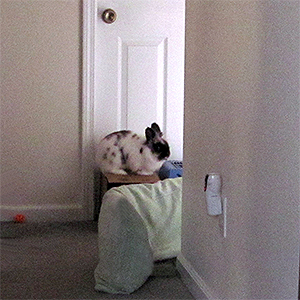 I’ve still got the top off of it waiting to see if he will venture in to the top just sitting on the floor and then maybe we can see if we put it together whether he will hop in and use it. 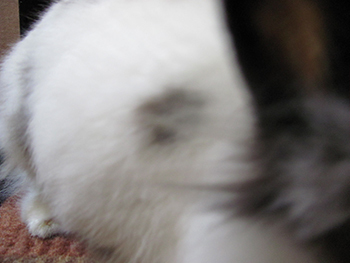 So this is the Booda Dome Clean Step Litter Box. We picked it up for Leo over the weekend. 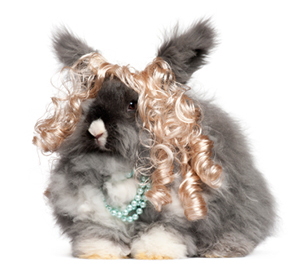 We thought a manly deep brown color was just the thing for our little bunny boy. We had a Booda Dome without the steps with Tigger and Shadow. They liked it. We thought this one with the step ramp in to the litter box would be more to Leo’s liking since he loves to hide places and he isn’t as adept at hopping into and out of things as Tigger and Shadow. So we thought the step ramp would be something Leo would like better. We forgot though that there is one thing Leo hates more than being out in the open and that is new things. So now we have the Booda don’t. As you can see in the picture, Leo isn’t willing to enter the room with this new “thing” in there. 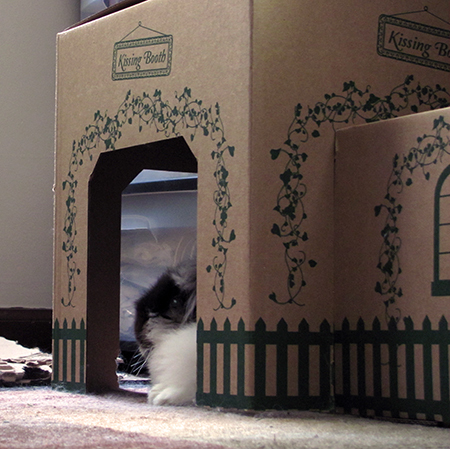 You can barely see where it is way across the room behind the cardboard cottage. I even removed the dome top trying to make it a little less scary to him. Leo alternated between hovering at the doorway and running top speed down the hall and back in to the office. He sits at the doorway just staring at it. I have no idea what Leo thinks it is going to do, but he clearly plans to keep an eye on it and maintain a safe distance. 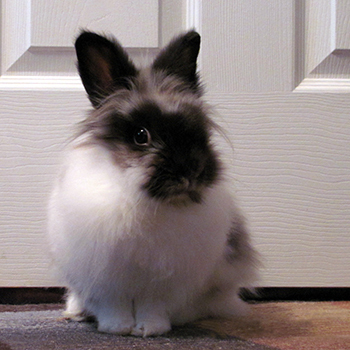 I’ve read that the eyes on a Lionhead are more prominent than other rabbit breeds. 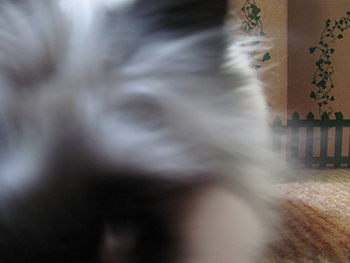 What that means to us is that when Leo gets scared about something, he really looks bug-eyed. Okay, so this picture is a bit later and looks like progress. Except Leo never likes to be out in the open in this room and is never in this spot. His favorite spot is behind the cardboard cottage. 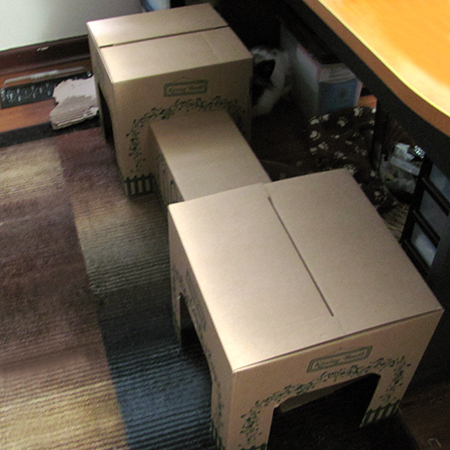 However now, the new litter box is behind the cardboard cottage. So Leo is more willing to expose himself in the open than go back by that new “thing”. I do hope this isn’t going to be a repeat of the pet bed. I’ll share that story tomorrow. Although we buy things that look like good fun for our rabbits, I also look to repurpose things we already have for rabbit use. 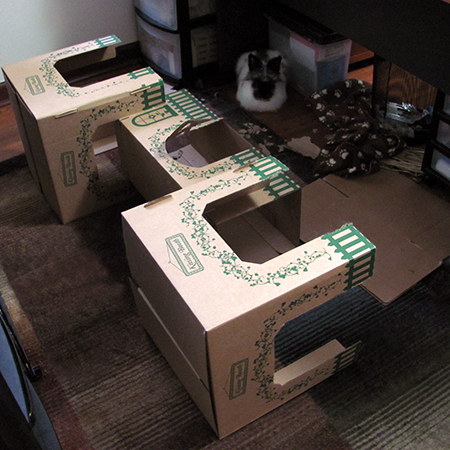 And sometimes what I repurpose, the rabbits have repurposed even further. That is the case with Leo and his “hillow”. When I was having some back problems, I bought a body pillow to see if it was more supportive, but didn’t find it helped me out much. I was thinking about giving it away. 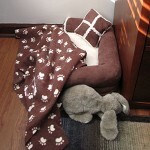 Then I decided to put it on the floor in Leo’s hallway run area and wrap it around the corner as kind of a bumper and to keep him from chewing carpet right at the corner. With Tigger & Shadow we had always found corner areas to be the place where they seemed to go after the carpet the most. It didn’t work out exactly as planned, because being a pillow it is light and easy for Leo to move it. And move it he did. At first he pushed it over a lot and was climbing around on it. Then one day, he just kind of burrowed in between it and the wall creating a little space just wide enough for him to fit between the pillow and the wall. He loved it. 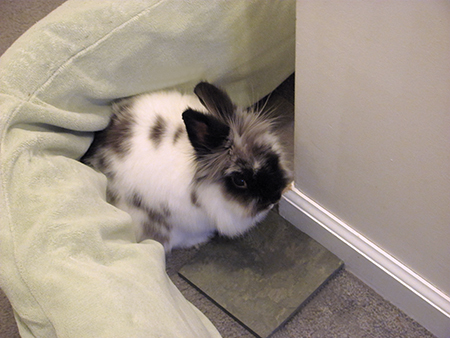 After that, he kept burrowing the pillow away from the wall. 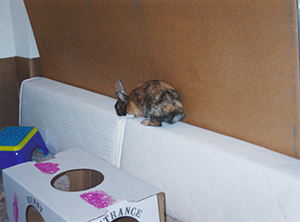 It became a place for him to hide out, but if he is sitting up, he can still see anyone approaching him from any direction. He loves to run around it and through it and sometimes he still goes over it. 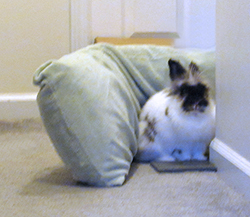 When I realized how much he liked that semi-protected space he had created, I always make sure now to set the pillow down curved around the corner just wide enough for Leo. I realized it looked a bit like an earth mound, especially since the pillow has a green cover. That is when I started calling it Leo’s “hillow”. 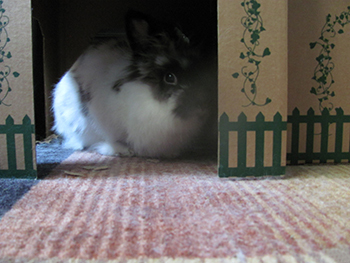 I put some ceramic floor tiles down over the carpet around the corner so he doesn’t chew the carpet there. Leo hasn’t tried to lift or move those and actually likes to hang out right in the corner of his “hillow” sitting on the tiles. 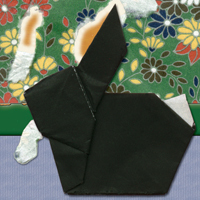 I would love to hear if others have some things they or their house rabbits have repurposed just for bunny use.